Yay! Tonight is Guy Fawkes Night, so we will all wrap up warm, stand round a large bonfire, and look up at the fireworks over Alexandra Palace, while partaking in a collective ooooh and aaaaah as the sky lights up. Alexandra Palace is not a royal residence, but was purpose built in the 1870s as an entertainment venue, and as it is perched in a hill, if is the perfect place for a fireworks show. I’ve been in previous years, and it’s great, but this year, I’m lucky enough to be heading off to the house of some friends who live nearby, so I get all the benefits of an amazing show, but all the comfort of being in someone’s garden, with food and drinks within easy reach. For the party, I produced two contributions. One batch of spicy roasted tomato soup (see here) which I had jazzed up with a bit of Piment d’Espelette, so I won’t repeat that one today. 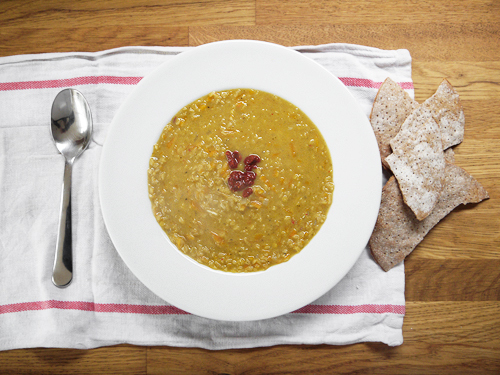 And to offset this healthy, hearty and savoury soup, I also whipped up a batch of toffee apples. 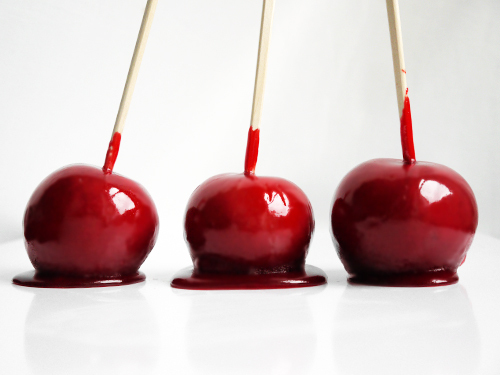 As you can see, they are the classic sort – small, on a stick, and bright, bright red! This was the first time I’ve made them, so there were, of course, a couple of things to think about. First, what sort of apples? While I have a source at work who comes in each Monday morning weighed down with cooking apples, they were too large and a bit too tart for this. Perfect for a pie or a Waldorf Salad, but not here. No, the apples need to be smaller, but sweet, juicy and crisp. 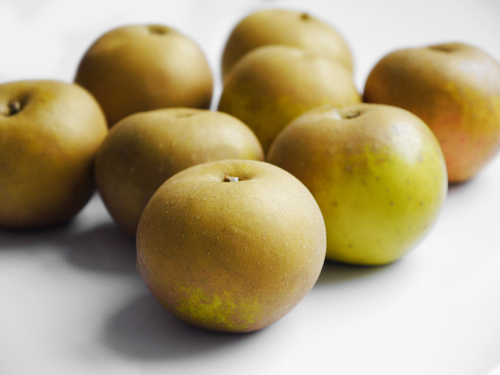 So at the greengrocer, they were selling small russet apples. Perfect! Now, the obvious next question – what to coat them with? Should it be the pure sugar caramel coating, coloured shocking red, or a more muted butter-and-brown-sugar toffee? Well, I went for a combination of both. The dipping toffee is a combination of white and brown sugar, butter, cream, vinegar (! 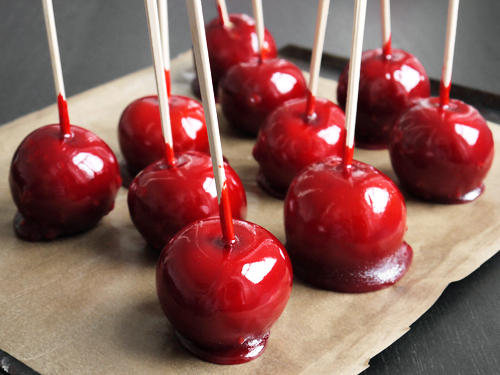 ), golden syrup and a dash of salt, then a good dash of food colouring to get the classic red colour. I know, I know that I could have stuck with the natural colour, but this is a night for bright colour. Plus, it’s only once a year. 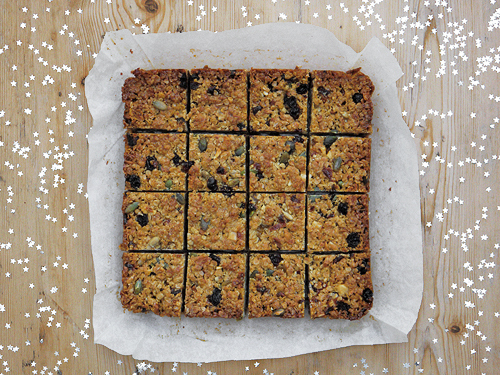 So…if you fancy making them, then there is still time today! Just get apples, wash and dry them. Then make the toffee, dip the apples, and you could be enjoying them by the bonfire in less than an hour. And if you want to make them ahead of time – be warned! The sugar coating will absorb moisture from the air, so make them as late as possible, or store them wrapped in lightly greased or buttered cling film in a sealed container. You’ve been warned. Don’t blame me if then turn into a sweet, sticky, red mess! Enjoy the fireworks – and enjoy them safely! First, wash the apples. Put into a sieve and then pour lots of boiling water over them (this will help to remove any wax – you’ll see that the wax turns white and can be wiped off). Dry well with a clean cloth. 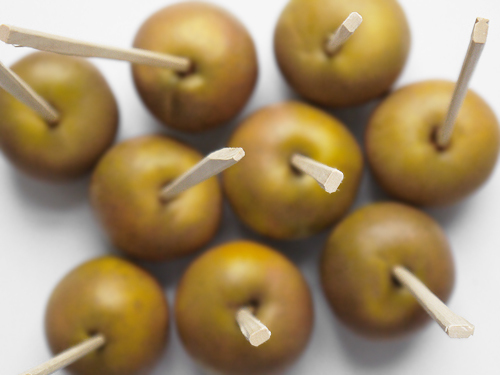 Put a twig or wooden skewer into each apple. I used wooden chopsticks. Prepare a baking tray by lining with greaseproof paper, and grease lightly with butter. Next, make the toffee. Put all the rest of the ingredients into a saucepan. Bring to the boil, then cook on a medium heat without stirring (for around 20 minutes), until the mixture reaches 140°C (280°F). Either use a sugar thermometer, or check by dropping a spoonful of the mixture into cold water – if you get very hard drops, it’s ready. If it is still quite soft when you squeeze between your fingers, keep cooking. 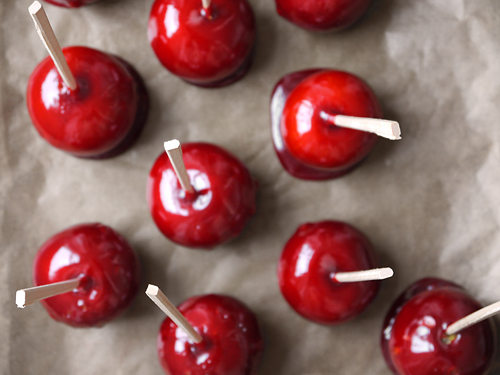 Remove from the heat, and as soon as the toffee stops bubbling, dip each apple in the caramel. 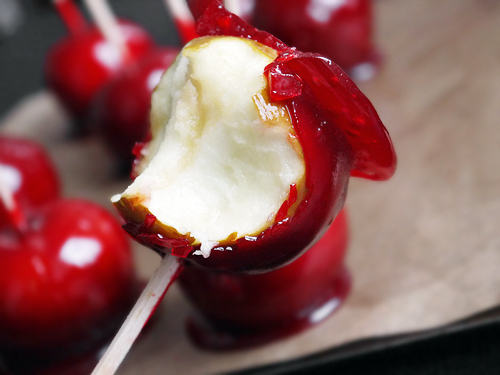 Rotate the apple quickly to ensure an even finish, then place on the greaseproof paper to cool. Worth making? These apples are sticky and basically everything will end up reg (hands, tongue, face) but they do have a lovely caramel flavour which is super with the apples. And hey, it’s only once a year…surely not that bad for you?